It’s hard not to get lost at the Consumer Electronics Show. The event is simply huge. My colleague logged over 20,000 steps on his fitness tracker wandering around the show in a single day. The space spans three different halls at the Las Vegas Convention Center, another at the Sands Expo Convention Center, as well as more exhibit and meeting spaces in the Venetian and Westgate hotels. As if that’s not enough, the show spills out into tents scattered over two huge parking lots near the convention center. This leads everybody to ask the same questions: Where am I? How do I get to booth 26002? This year, Radius Networks had the answers. We built an indoor navigation system covering 4 million square feet of exhibit and meeting space. Simply opening the maps section of the CES Mobile app for iOS and Android showed which hall you were currently in. Tapping on the hall name displayed a map centered on your current location marked with a blue dot. And booth 26002? Entering that into the search box (or the name of the exhibitor) highlighted its location, and if not in the same hall, told you where you needed to go. Building and deploying this system was a big job, partly because of the huge physical space. What’s more, keeping costs down meant abandoning the cookie-cutter solutions of traditional indoor navigation systems. Because CES is a temporary show, we didn’t have the luxury of using carefully placed permanent wireless access points as reference signals. Because of the huge square footage, we couldn’t spend the time and money it would take to gather RSSI fingerprint samples over 4 million square feet. What we did do was deploy nearly 1000 low-cost Bluetooth Low Energy beacons on an 18-meter grid around the show. Because access to power supplies was limited, we did this largely with tiny coin-cell powered beacons, although we also used USB-powered beacons with AC adapters where wall power was available. The beacons had to be set to a relatively high advertising rate of 10 Hz in order to get good distance estimates, but this was OK, because even coin cells could power this advertising frequency for the short duration of the show. Once beacons were deployed, showing the user’s location was a matter of plotting the location of the nearest beacon, with some special logic added to keep the dot from bouncing around. For the tents in outdoor parking lots, we saved money by not deploying beacons at all – we just piggybacked on mobile phones’ GPS capabilities to plot the user’s location the old-fashioned way. Setting this up quickly was only possible because of lots of preparation and a fine-tuned configuration app that let our team of six mark the locations of placed beacons before moving on to the next one. With less than 48 hours to set up the entire show across four million sqare feet, there was little time to waste. The map below shows the locations of some of the 143 beacons placed around the CES Central Hall. This image shows just a subset of the huge Central Hall, which is four football fields long and one and a half football fields wide. Even with all the advanced planning, there were challenges, requiring us to think on our feet. Many exhibitors blocked access to their space with burly security guards, forcing us to find creative places to put our beacons around the perimeter. Some beacons placed near the boundary of two different halls had signals that bled onto the adjacent hall, requiring us to rethink placement. The massive load of tens of thousands of CES attendees arriving and downloading the mobile app all at once required our team back at home to fine tune our servers in real time. And as with any project involving a large amount of mundane, repetitive manual work, there was some human error. Finding and correcting these errors could be time consuming. Deployment was not even the biggest challenge. Long before we arrived in Las Vegas, we did a huge amount of work to prepare 18 different maps, precisely align them with a reference coordinate system, and update the booth locations as they chenged along with the show. 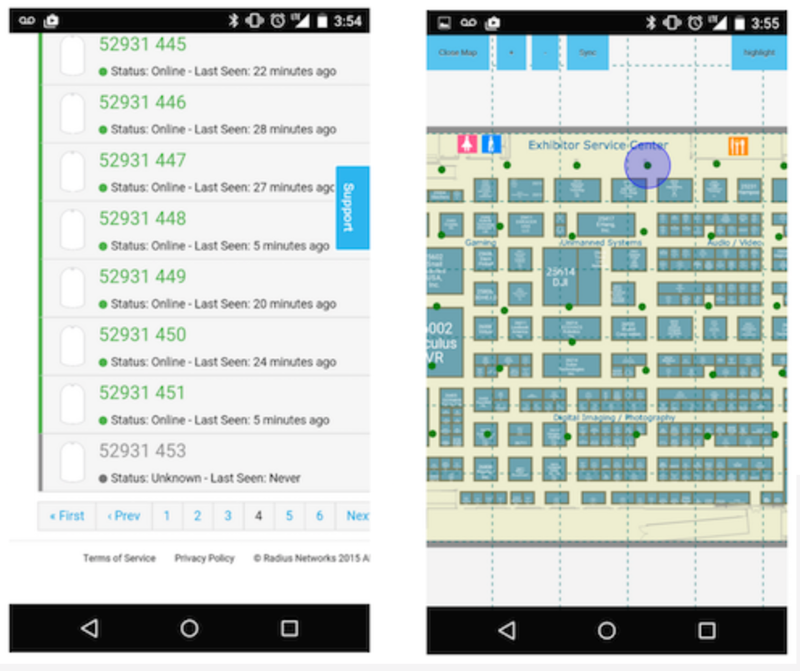 Being able to search for a booth and highlight its location required that a dynamic database be kept up to date as new exhibitors joined the show and changed their booth locations. While still in our home offices in Washington, DC, we deployed the system at other venues like the Verizon Center, where we tried it out successfully during a crowded Washington Capitals game. Having good venues for testing was critical, due to the tight deadlines on the project. Often engineering deadlines are artificial. In the case of the Consumer Electronics show, there was no way they were going to delay the event if the indoor navigation system wasn’t ready. The only way this was possible was because we could construct the system on top of other services we’d already built at Radius Networks: our Proximity Kit service (proximitykit.radiusnetworks.com) for managing beacons in the cloud, our Android Beacon Libraryfor bringing beacon detection and ranging capabilities to the Android platform, the AltBeacon standard which brought an open beacon standard to mobile devices, and our new Director service for alerting us if any of these hundreds of beacons went down. One critical function was to check to see if any beacons were not being detected. On the first day of the show, Director told us a few beacons in the South Hall hadn’t been seen. We used our configuration app to show these beacons’ locations on a map, letting us find them super fast. In one case, the beacon was turned off. In another, the beacon’s identifier was misconfigured, and in yet another, the beacon had gone missing – requiring a replacement. In the end, all this work paid off. Even though I had spent weeks staring at the maps, I found that even I got lost at CES, too. Finding my way back to the taxi line after two days of setup, I was confused by seeing a Panasonic booth. Wasn’t that in another hall? Where am I? Fortunately, after a few taps on my mobile phone, I saw a friendly blue dot showing me the way.